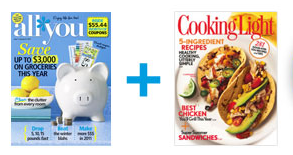 All You and Cooking Light Magazines for $25! You can feed your family for less with the great recipes, coupons, and money saving tips you’ll find in All You Magazine and Cooking Light Magazine. I subscribe to both magazines and love them both! Right now, you can get this combo for $25 total and it includes a one year subscription to both magazines! You’re saving $65.77 off the cover price! Each subscription includes 12 issues, so you’re paying $1 per issue! 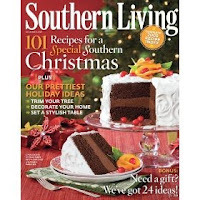 This would make a great gift for someone who loves to cook! If you’d prefer to just get All You Magazine, you can get a one year subscription for $19.95 plus get a $5 Walmart gift card. The retail price is $2.49 per issue! Best Deal Magazines is having a “Day after Christmas blow-out” sale. The sale is valid on 12/26 only and includes most titles. You get an additional 18% off most titles when you enter the code AFTERXMAS18 at check-out. Don’t forget to shop through Ebates to get an additional 10% cash back. Click on “$4.69 Subscriptions” – these will be $3.85 for a one year subscription after the discount! Click on “$5.95 Subscriptions” – these will be $4.88 for a one year subscription after the discount! 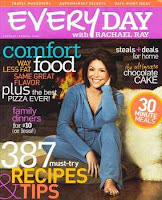 Get a one year subscription to Everyday with Rachael Ray for $4.99! Click here and click on “Buy now.” Enter the code ee78 and click on “Update Cart.” Your new total should be $4.99. You can pay using Visa, Mastercard, Discover, or Paypal. I was excited about this because my subscription had just expired and I hadn’t been able to find a good enough deal to justify subscribing for another year! Hot magazine deals: Family Circle, Taste of Home, Parents and more from $3.56 for a one year subscription! I never realized how much I love magazines until I learned that you can get a one year subscription for about the price of an issue. Many magazines are now offering great coupons, too, which is an added bonus. Family Circle – Click here, add to your cart, and then enter the code SECRETSALE17 at check-out to get it for $3.56 (for 15 issues!) – this magazine has great recipes, craft ideas for kids, and coupons! Family Fun Magazine – Click here, add it to your cart, and then enter the code SECRETSALE17 at check-out to get it for $3.89 for a one year subscription! Parents Magazine – Click here, add it to your cart, and then enter the code SECRETSALE17 at check-out to get it for $3.89 for a one year subscription! Taste of Home Magazine – Click here, add it to your cart, and then enter the code SECRETSALE17 at check-out to get it for $3.89 for a one year subscription! Weight Watchers – Click here, add it to your cart, and then enter the code SECRETSALE17 at check-out to get it for $3.89 for a one year subscription! Woman’s Day – Click here, add it to your cart, and then enter the code SECRETSALE17 at check-out to get it for $3.89 for a one year subscription! I just renewed my subscriptions to Family Fun, Family Circle, and Parents Magazine for $11.35 total! They also have the option of giving a subscription as a gift! This deal ends tonight at midnight! Here are this week’s freebies! Enjoy! Sign up for a free nutrition e-news letter and get a free copy of What to Expect When You’re Expecting! Here’s the scoop: As a marketing promotion for Subscription Rewards Newsletter, we are able to offer you a selection of magazines for FREE when you signup for our Free Newsletter. Just pick your free subscription and provide the delivery address.That’s It!